A number of WordPress plugins are notorious for not removing data after the plugin has been uninstalled – MonsterInsights is no exception. This can bloat the options database table. If you installed a couple of plugins to test on a site, then removed them, this can all lead to the options table growing or custom database tables being added but never removed. The result is a site database which now has unnecessary data in it for plugins that are no longer being used. In short, it’s easy to create a mess. Let’s help clean it up using WP-CLI, phpMyAdmin and Adminer. MonsterInsights plugin is a commonly used plugin for Google Analytics integration on WordPress sites. The plugin does have one major shortfall along with a number of other plugins, in that it will not remove any of the data it created, if the plugin has been deactivated and then deleted. No we will go through each of the methods for cleaning up these options starting with WP-CLI. MonsterInsights will still keep a number of options values bloating up the sites options database table, but WP-CLIis there to come to the rescue. If you are used to using a database manager with a GUI like phpMyAdmin then you can easily delete the option values that MonsterInsights plugin has left behind. Select the wp_options database table and then select data, which will show you the records in the options database table. 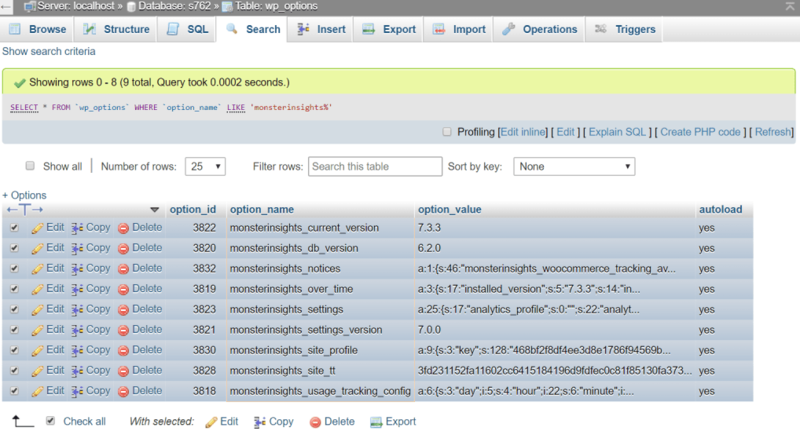 Now click the Search tab and find the option_name field, enter monsterinsights% for the value. Click Check all to select all of the Monsterinsights options and click Delete. Repeat the same process for _amn_mi% to search for those option_names. You can use a plugin like ARI Adminer. Install ARI Adminer as you would any normal WordPress plugin. In the admin sidemenu, go to ARI Adminer > Run Adminer > New Window. 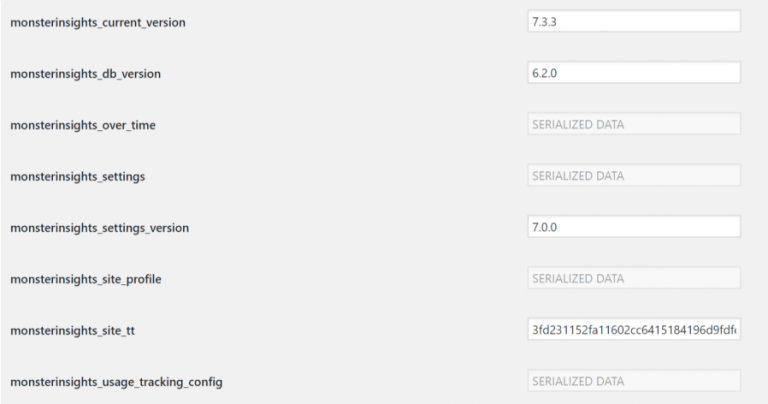 In the left pane, find the wp_options table and click it. You will then see the records in the options database table on the right. Click Select in the top right. Click Modify to select all of the Monsterinsights options and then click Delete. Repeat the same process for _amn_mi% to search for the additional leftover option_names from MonsterInsights.